Before construction activity may commence a performance bond must be posted for the trees to be replaced. Trees must be marked; blue for trees to be saved and red for trees to be removed. 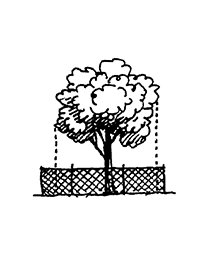 Trees which are to remain and which are within 25 feet of construction activity must be surrounded by protective fencing or other approved physical barrier at their drip lines. Large groups of trees to remain can be fenced as a group.